Description : I really like how this one turned out. Ginny and Hermione just look so comfortable sitting there chatting. I think those two have become great friends in the last few years. Awwww! Crookshanks looks so cute! I love it, they look so compn)onable. And I also love Hermione's overalls. Good thing they're allowed at Hogwarts! Yes, since the story is from Harry's POV, we don't really get to see these two having "girl time". But I agree; I believe they're close. How cute this is. Adorable, they look like the best of friends. Hermione's overalls are cute. Hermione does look like an "Overalls Girl" like Mia in the Princess Diares books. No, they never mention anything other than their robes or Weasley sweaters if I recall. 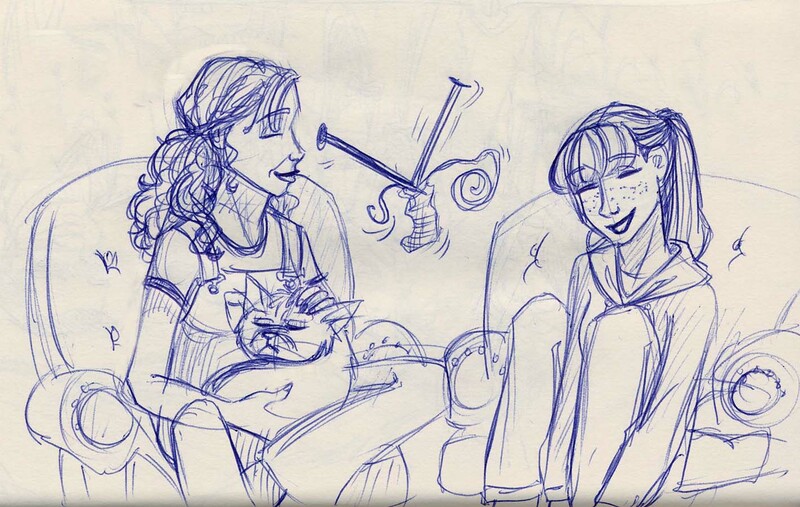 I've always liked your drawings of ginny and hermione, this included!!!!!! Ginny's closest thing to a sister.